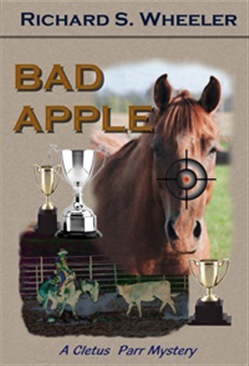 The world's greatest cutting horse, Bad Apple, has been shot in his paddock. The grieving owner, Rex Pattee, wants to know who did it and why. He hires a livestock detective, Cletus Parr, with an office in the stockyards, to find out. The homespun Parr is soon talking to jet set horse owners, who think he's a rube. And that is an asset. He slowly figures out who did it-- and just in time. Richard S. Wheeler is the author of over seventy novels, mostly set in the American West. He has won six Spur Awards from Western Writers of America, and the Owen Wister Award for lifetime contributions to western literature. Acquista Bad Apple in Epub: dopo aver letto l’ebook Bad Apple di Richard S. Wheeler ti invitiamo a lasciarci una Recensione qui sotto: sarà utile agli utenti che non abbiano ancora letto questo libro e che vogliano avere delle opinioni altrui. L’opinione su di un libro è molto soggettiva e per questo leggere eventuali recensioni negative non ci dovrà frenare dall’acquisto, anzi dovrà spingerci ad acquistare il libro in fretta per poter dire la nostra ed eventualmente smentire quanto commentato da altri, contribuendo ad arricchire più possibile i commenti e dare sempre più spunti di confronto al pubblico online.